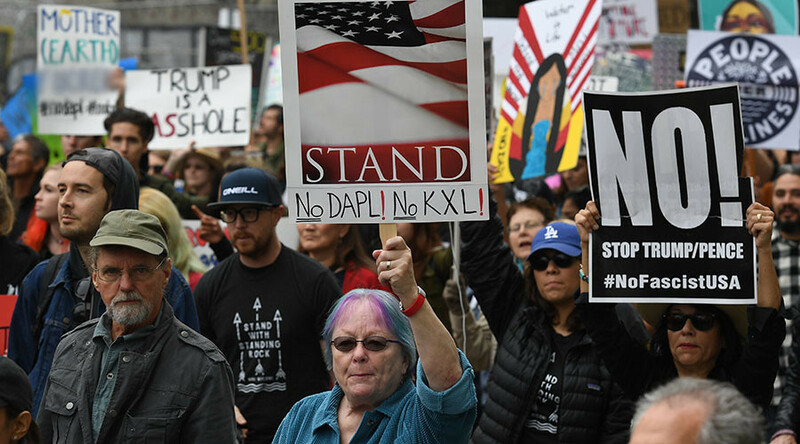 Thousands of people marched in LA to protest US President Donald Trump’s executive orders restarting the construction of the Dakota Access and Keystone XL pipelines. The demonstration was organized in the wake of the orders that advance the projects in a move the Indigenous Environmental Network dismissed as “insane and extreme." Trump said he wants to move forward on the projects, which aim to connect the tar sands in Alberta, Canada with oil refineries on the Gulf Coast. The pipeline projects have become a key battleground for those opposed to the use of fossil fuels, as well as for the Standing Rock Sioux Tribe in North Dakota. The tribe says the pipeline is being constructed on sacred Native American land and will pass through Lake Oahe, their primary source of drinking water. Police say the LA gathering was peaceful and no disruptions or arrests were reported. If completed, the Dakota Access Pipeline project will carry oil from northwest North Dakota to Illinois, passing through South Dakota and Iowa. The Keystone XL pipeline is designed to carry oil from the oil sands of Alberta in Canada, to Nebraska, where it would connect with an existing pipe. The Standing Rock Sioux Tribe are camping at the construction site in protest. There have already been occasional clashes with police at the encampment. White House spokesperson Sean Spicer said Trump plans to discuss the terms and conditions of the construction with all parties involved, including the Native Americans, and to negotiate a deal that benefits everyone. Last week Phillips 66 CEO Greg Garland, a stakeholder in the Dakota pipeline, said he expects the facility to start operating later this year, despite the wave of protests and ongoing legal battles. The pipeline is currently under review by the US Army Corps of Engineers.